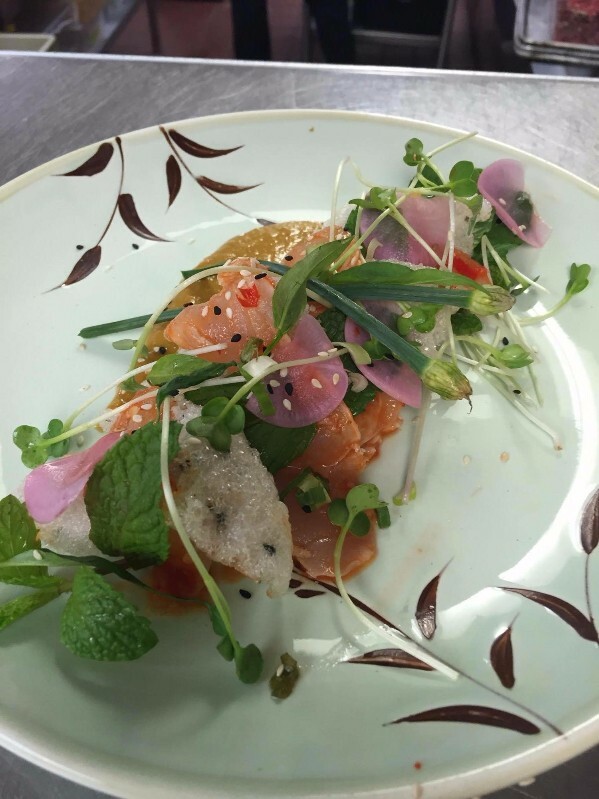 Goi ca, a Vietnamese crudo. After 16 years in Vietnam, chef Geoffrey Deetz is back in Oakland and ready to unveil his first local restaurant since he left in 2000: The Temple Club at 2307 International Boulevard, in what used to be Bakeshop Oakland. He expects to open in three to four weeks. Naturally, the Temple Club is Vietnamese. 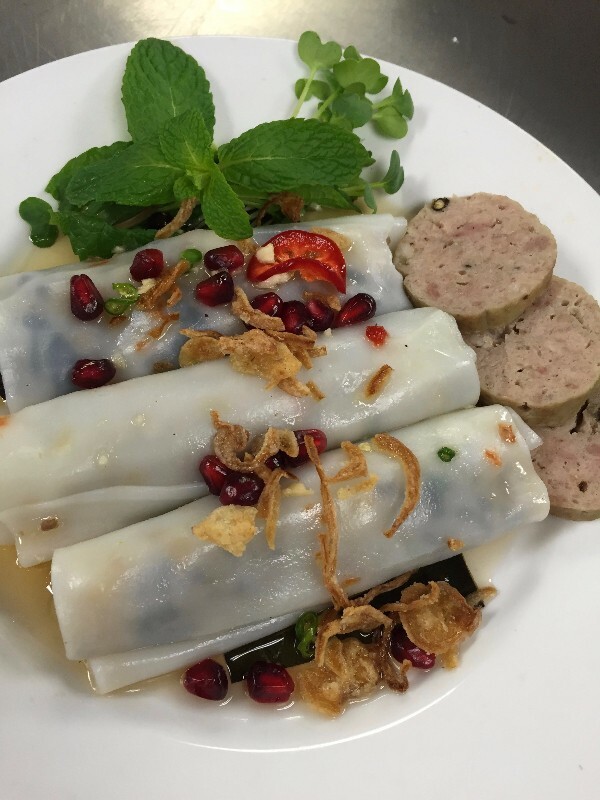 But Deetz promises a decidedly different style of Vietnamese restaurant for the East Bay. It will offer a short menu, focusing on dishes from central Vietnam, along with some from the north. Instead of a cocktail bar, he envisions a juice bar. And once a week, he plans to host a special themed dinner, offering just one entree, like so many restaurants do in Vietnam. Expect loads of accompaniments — herbs, pickled vegetables, sauces, crushed nuts — specific to dishes you can't find at other area restaurants. “We’re gonna serve the food exactly the way it’s served in Vietnam,” he says. Before his move to Vietnam, Deetz was known for restaurants such as Spettro on Lakeshore Avenue, Gulf Coast Oyster Bar in Old Oakland, and Dragonfly Teahouse in Berkeley. In Ho Chi Minh City, otherwise known as Saigon, he went on to open a number of restaurants, including the much-lauded Black Cat. Fast-forward to 2016, and Deetz returned with the goal of bringing his adoration for Vietnamese cuisine to Oakland diners — along with getting his young, half-Vietnamese kids an education in the United States. The Temple Club will feature a large mural in a similar aesthetic to post-war propaganda posters that were plastered across Vietnam in the 1970s — not the ones picturing bombs and guns, rather, promoting community efforts. There will also be a mezzanine, upstairs patio and open kitchen. Deetz will start out just serving lunch, eventually expanding into dinner — with beer and wine — within a few months. He anticipates a price point of $5-$14 per dish, with smaller portions meant to be shared. That said, someone could also come in and just get a bowl of mì quảng (a dry noodle dish topped with shrimp, pork and rice crackers) and call it a meal. Don’t be surprised if there's no pho. “If you want to talk about Vietnam’s most popular noodle dish, it’s instant ramen,” Deetz quips. Shrimp and pork banh cuon with chả lụa. Instead, you might see more French influence — again, as it is done in Vietnam and not in a ‘90s fusion style. His signature dish will be one he first tried in the 1980s and still adores: goat curry, served with warm bread, butter, pate and a small salad. The Temple Club will be located at 2307 International Boulevard. Follow along on Facebook for updates.